Thermal equilibration is of practical value for cold storage management. 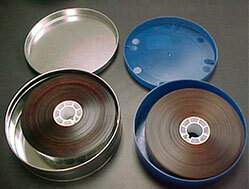 Since access to films stored at low temperature might be needed on short notice, a risk of damage by water condensation exists. When an artifact is brought from cold/frozen storage into a warmer environment and its temperature is lower than the dew point of the air, moisture condenses on the outer surface. As described in Low Temperature Storage Implementation Basics, two approaches are possible to avoid moisture condensation on the film. First, it is possible to create a temperature-and humidity-controlled environment such that the temperature of the film is always above the dew point temperature, normally by dehumidification of the air. This approach relies on the use of a climate-controlled staging room. The second alternative relies on the use of moisture-proof bag so that the moisture condensation does not affect the film. For both options the safest approach is to access the film when thermal equilibration has been reached. The most common recommendation is to allow the film to warm-up overnight or for 24 hours prior to remove the film from its moisture-proof housing. The table below provides insights into the rate of temperature equilibration for various film configurations. For the most part, the thermal mass provided by the film, governs ultimately the time necessary to reach equilibrium. Empirical data developed at IPI indicate that full equilibration is almost achieved in a matter of hours. Most importantly, these estimates were found to be relevant for any temperature transitions that are commonly encountered film in archives.